Considering the severity of the risks and given that it is all up to me, the pilot, to make the right decisions in order to stay alive, I want to focus this section on some of the biggest and most insidious risks of ridge flying along with tips and techniques to mitigate them. 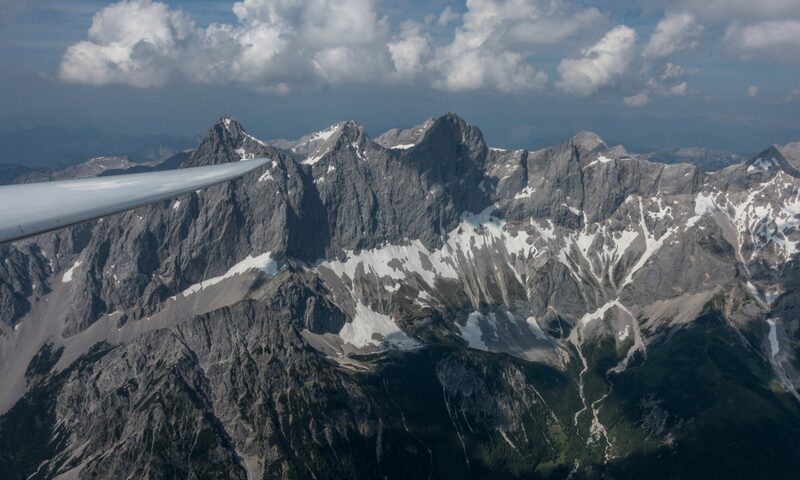 What are the main dangers of flying on ridges? Even highly experienced competition pilots have died in stall and spin accidents along the ridge. The simplest and most common explanation of such accidents is that the pilot was flying with insufficient speed, may have encountered turbulence or a gust from behind, the glider stalled, spun in, and the height was insufficient to recover. But is that really the whole explanation, and why does this happen to some of the best pilots? From flying a lot of ridge races on the Condor soaring simulator I believe there’s more to it: I think the underlying reason has to do with the shifting horizon when flying in mountainous terrain. It’s most insidious when you’re circling below the ridge top (one more reason why you should’t). Imagine you’re in a level turn flying away from the ridge: the horizon in front of you drops down (you now see the valley below instead of the mountain ridge above) so your intuitive reaction is to (unintentionally) lower the nose. The glider will speed up and no harm is done (except you may briefly fly out of rising air). Now imagine you keep turning towards the ridge: the horizon climbs rapidly relative to the instrument panel in front of you. Your intuitive reaction is to raise the nose! You may not even notice that you’re doing it until the plane suddenly stalls and the inner wing drops away. The closer you are to the terrain the stronger this visual illusion becomes. In the worst case the problem may even be amplified by your instinct to increase the bank angle and pull up even further to avoid hitting terrain. And there’s one more thing that makes this even more insidious: when you fly towards the ridge, by definition (if you’re ridge soaring), the wind is now at your back. So your ground speed is higher and your eyes will tell you that you are flying faster than 10 seconds ago when you were turning away from the ridge even though your air speed has actually dropped significantly. So your visual references make you believe that you are accelerating when in fact the opposite is the case and you are rapidly approaching a stall or worse. This optical illusion is extremely deceptive and I’ve had this happen to me more than once during those Condor races. The only reason I am able to write about it is because I was flying a simulator! So how can you make sure that you always keep your speed up and that this doesn’t happen to you? You may not like my answer but I believe that the only sure way of avoiding this trap is to never turn towards the ridge until you are safely above it (and can see the horizon beyond). When you reach the top of the ridge the horizontal component of the wind increases. Unless you correct for this immediately with a higher crab angle you risk drifting over the ridge and into sink and turbulence. Now you have to fight a headwind to make it back into rising air and you might simply be too low. Hopefully you have thought about this possibility before and there is an escape route on the lee side. In the best case you will simply loose a lot of altitude. If you’re less lucky you may find yourself in unlandable terrain deep down in the next valley with no way to escape. When you’re flying towards a ridge from the lee you must actively use your brain and not trust your eyes: if your eyes see an increasing amount of terrain appear behind the ridge as you approach it, your brain will automatically think that you have the ridge or gap made. If you can maintain the same glide angle that is also true (and it normally works when you cross a gap from the upwind side). The problem is that your eyes don’t account for the sink that you will encounter before getting to and over the ridge. In other words, they don’t see whether and how much the glide angle will deteriorate. There is obviously no universal rule by how much the glide angle will worsen and how much extra altitude you need so you have to be cautious. That means you should approach the ridge or gap crossing from a shallow angle (approx. 45 degrees will normally work) and be prepared to turn around should the sink be worse than expected. Jean-Marie Clément mentions another insidious trap: when you cross low over a ridge from the upwind to the downwind side your variometer may suddenly indicate strong lift because we’re crossing from an area of positive pressure into an area of negative pressure. You might think you have found a thermal in the wind shadow of the ridge when in fact there is nothing but heavy sink. If you started to circle expecting a climb the consequences could be catastrophic. You won’t be deceived if you remember this phenomenon. But it’s even better if you can keep a firm rule to never circle until you’re well above the ridge. Helmut Reichmann, three-times world gliding champion and author of “Streckensegelflug”, the perhaps most influential soaring book of all time, died on March 10, 1992 in a head-on collision with another glider on Tête du Peyron, a big mountain in the French Alps. Even if both gliders had been equipped with modern Flarm systems, if they had been installed correctly, and if they had been turned on, this may still not have prevented the accident. Flarm works on the basis of UHF transmissions and the big rock faces may have blocked out the signal until it was too late. The only way to prevent such accidents is to always keep a good look out, expect the unexpected, and pass hidden corners with a distance that is wide enough to see oncoming traffic early enough to take evasive action. This is one of the most insidious death traps. When you’re flying along a sun-exposed ridge the warm air will normally cling to the slope, forming a thin sheet of air moving upwards until it breaks off from the top of the ridge to form a thermal. This thermodynamic airstream will amplify any other lift you find on the ridge. However, sometimes, invisibly and unbeknownst to us, a thermal will break loose on the slope below and begin to rise up vertically instead of clinging to the slope. This will usually be from a trigger point such as a rock-outcropping, a spur, a line of trees, etc. It turns out that this can be a lethal problem that has likely already killed numerous glider pilots. Imagine you’re flying close to the slope and the thermal breaking loose suddenly and forcefully lifts your outer wing: this will turn the glider towards the slope and gives you very little time to recover: imagine your glider banked 45 degrees toward the slope: just turning it level will take about 2 – 2.5 seconds for a 15-18m glider without water ballast; even longer for bigger ships. Try it out for yourself in open airspace: Bank 45 degrees in one direction, then deflect the ailerons fully to the other side and measure how long it takes until you’re back in level flight (or keep going until you’re banked 45 degrees the other way). There are several ways to mitigate this risk: 1) we should train ourselves to look out for potential thermal triggers on the slope below in front of us; 2) we must maintain a safe speed (10-20% faster than we would normally fly along ridges) that gives us more aileron control and a bit more energy to escape upwards if needed; 3) on strong thermal days and along sun-exposed slopes we should maintain an additional safety distance from the terrain. (We may get a better climb rate closer to the terrain but is it worth risking our lives for it? ); 4) on flapped gliders we should avoid any positive setting to have maximum aileron responsiveness; and 5) we must stay alert, ready to respond at the first indication of the outer wing lifting up. Imagine climbing up in nice lift along the face of the slope on the left below, wanting to continue on to the higher slope on the right. Deceptive Plateau – the danger is hard to recognize especially if the thermals are blue. Multiple textbooks cover the dangers associated with plateaus like this one. The lift breaks off at the edge of the first ridge and the air over the plateau is comprised of turbulent sink. Jean Marie Clément lists several unwary pilots that already got caught by this trap destroying their gliders on top. Cumulus clouds as drawn in my sketch make it easier to see; however, the situation is the same and a lot more insidious when the thermals are blue. The best way to mitigate this risk is to avoid the plateau or cross it with ample safety altitude. Living in Colorado has allowed me to observe the rapid formation of clouds on windy wave days. You might be flying along a ridge when suddenly – often within seconds – cap clouds form right on top of the ridge. If there is only a small difference between the temperature and the due point at the level of the ridge, it only takes a slight increase in moisture content of the oncoming air, or a small decrease in air temperature and the top of the ridge gets shrouded in cloud. If you spot the top of the ridge getting a bit hazy, it is time to increase the distance from the ridge and to fly away from it if any clouds develop. Especially in the densely populated Alps there are many wires strung above the slopes. They are hard to see and represent another insidious danger to glider pilots. Several pilots have lost their lives by colliding with such obstacles. Unfortunately not all cables are marked on maps so they are one more thing you have to look out for when flying along the ridge lines. You have to be especially careful around ski resorts: cable car wires are often suspended high above the ground and unless you can see a gondola that just happens to be going up or down, they can be very difficult to see. Cable car at the face of the Dachstein in Styria, Austria. The cable is very difficult to see. Ski resorts also use cables to transport explosives (called CATEX) to trigger controlled avalanches. In 2009 there were 73 installations of those in the Alps. Many tourist destinations have put up zip lines which can be another hazard. Fortunately these tend to be further down in the valleys. Use a GPS with an up-to-date obstacle database! It’s also useful to talk to local pilots before flying in unfamiliar terrain. As always try to avoid the vicinity of any thunderstorm. Even if it is further up in the mountains, its outflow may come down and reverse the airflow of the wind on the ridge that you’re soaring along. This is another insidious trap, especially for pilots who are used to ridge soaring near sea level and who are heading into higher terrain. You’ll know of course that the air gets thinner the higher you fly and that your true airspeed will be higher than your indicated airspeed. Don’t forget that this also affects your turn-radius! Let’s say you’re flying at 10,000 feet and you make a usual turn flying at an airspeed of 60 kt; suddenly you will need about 40-45% more space to complete that turn than what you’re used to from flying down low. The higher you fly, the more space you need! Human self-deception. Or: is something that is 99.9% safe, safe enough? In addition, the more often we survive an objectively dangerous situation unscathed the safer it appears to us even though the risk hasn’t changed one bit. Ridge soaring is a perfect example for that. The first time we fly in proximity to a ridge we do so with great trepidation. Chances are that nothing happened and the next time we are a little less fearful, and perhaps a little less careful. After 100 times it already feels perfectly safe. But is it really safer than the first time? It’s true that we’ve probably gotten a little better at it but we probably have never experienced some of the most insidious risks: we never ran into an invisible cable; we never got trapped by a thermal lifting our outer wing; we never experienced a sudden stall and spin due to a gust from behind; we never got caught in a suddenly forming cloud, we never crashed with another glider, etc. And because these things have never happened to us the last 100 times, we automatically believe that they won’t happen to us the next 100 times. So we lower our guard. We might fly closer to the ridge. We might fly slower that we did when we started out. We might use positive flaps when we shouldn’t. We might circle where we shouldn’t. We might lower our safety margin when crossing a gap. We might fly closer around hidden corners. We might not prepare as diligently as we did when we started out. The net result of all this is that our ride along the ridge actually became riskier than when we started out, despite or even because of our greater experience. I believe this is perhaps the main reason why so many of the world’s best pilots have had fatal accidents. They were no longer as aware or as concerned about the risks. They felt safe because of their experience. And in that line of thought – most of it likely subconsciously – they deceived themselves. Catch yourself the next time when you think that something is 99.9% safe. If you’re right it means that it is only safe 999 out of 1000 times. How often have you taken a similar risk already? And when will be the one time out of a 1000 when it is your last time? Remember that if you think that something is 99.9% safe, then don’t do it. Because 99.9% safe is simply not safe enough. What are the ridge flying rules? We should always follow the basic rules of the air that we learned during our initial flight training. But we should not think that following the rules alone will be enough to keep us safe. And we should not rely upon others following them either. Never try to pass under or over another glider. Always approach a slope from an acute angle (never head-on) and without hindering or endangering anyone else. The same holds when you re-approach the slope after a turn. The FAA Glider Flying Handbook in the United States also contains the rule that if you’re overtaking another glider you must do so between that glider and the ridge. The argument is that the glider you’re overtaking won’t turn towards the ridge. I must say I don’t like this rule and I won’t attempt to overtake another glider between it and the ridge. What if the pilot in front of me decides to move closer to the ridge just as I’m trying to pass? It seems this rule is inviting disaster. I think it’s better to either slow down or turn around and climb until there is a safe separation in altitude between the gliders. Or, if you believe you must pass, then fly out into the valley until you’re at a safe distance if the pilot you’re attempting to overtake should decide to turn away from the ridge. Finally, you could always try to contact the other pilot by radio and agree on what you’re both going to do. Local clubs may have additional traffic rules for highly frequented slopes. Here’s an example from a club in the UK. What should I do (and don’t do) to say save? Don’t stay on a ridge that doesn’t work – fly away from it! Don’t get caught in self deception: just because something bad hasn’t happened the last x times it doesn’t mean that it won’t happen the next time. Maneuvers that are 99.9% safe are never safe enough.